Keep your pets indoors whenever possible. Indoor pets live longer, are less likely to contract disease, be hit by a car, abused by people, injured in fights with other pets, or taken by a predator. Safeguard pets in your yard. If you do allow pets outside unaccompanied, keep them within a completely enclosed run, or in a well-fenced yard with a clear view. Provide pets with an access door into the house or a safe place to hide if they are threatened. 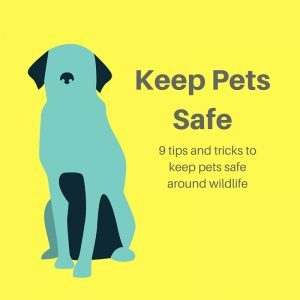 Pets are safer outdoors in bright daylight rather than at dusk or dawn when predators are actively hunting, so bring pets inside in the early evening. Once pets are inside for the night, lock access doors. Never chain. People often tie out a dog as a guard animal or tether a goat or sheep to keep down grass or brush. Tethered animals are an invitation to predators, and are unable to move freely to flee or to protect themselves. Feed animals indoors. Predators have a highly developed sense of smell, and may pick up the scent of cat or dog food from a distance. Feeding cats and dogs outdoors invites skunks, opossums and raccoons to lunch, and larger predators like lions and coyotes may follow. Keep your yard clean. Picking up dog droppings regularly will help keep wildlife in the woods where they belong. Dog droppings may smell like rich food to raccoons, coyotes, skunks and foxes. For the same reason, garbage cans should be closed and secured against scavengers. Remember that small wildlife will eventually attract larger predators, and that wild animals of all sizes can be dangerous to your pets. Think seasonally. Seasonal changes disrupt a habits and force lions out of normal patterns of movement in order to seek out prey. Because they are opportunistic hunters, lions will take any animal that looks and smells like food and that does not appear to present an immediate danger. It appears that mountain lions are most likely to be tempted by domestic animals when deer herds are migrating. Unfortunately, this is also the time when many domestic animals are born, and therefore most vulnerable. Heavy snow, orchard windfalls, and mating seasons will also affect wildlife behavior. Keep wildlife at a distance. Clearing brush and shrubs from a bsckyard and establishing a limit line between wild areas and domestic operations can keep wildlife from having a place to hide. Smaller wild animals draw in larger wildlife and carry their own risks, too. Look over your yard for places that raccoons, skunks, oppossums and rodents might take up residence. Walk pets on a leash. Out on the trail, keep dogs on a leash. Wide-roaming pets face all kinds of danger, not least of which is rousing a sleeping predator, which may chase the pet right back to his owner. Attaching bear bells to your dog’s collar will alert wild animals to your pet’s presence long before he is visible, and protect the wildlife as well as the dog. If your animal does encounter wildlife, and appears to be at risk, intervene only from a safe distance, by shouting for help, throwing rocks and sticks, but keeping your own safety the primary concern. Consider fences or frightening devices. Fences may help to prevent both deer and mountain lions from choosing your backyard or pasture over your neighbor’s. And installing motion or timer-activated devices around your animal enclosures may help keep predators away. Remember that it is as important to scare away the lion’s potential wildlife prey as it is to scare away the lion. Alternating simple devices using water, sound, light can provide non-lethal methods for habituating wildlife to stay far from your backyard. Heard a lion last night around 1:30am growling at neighbor dogs on Matterhorn. Couldn’t see it in the dark, but sounded like a very large predator. Dogs are large pit bulls, so maybe the cat decided to move on.